Assisi, Italy–a town I laughed at when I was a kid because I thought it was pronounced “a sissy.” And when you’re a kid, something being called a sissy is knee-slapping hilarious. Unless it’s yourself, of course. Then it’s the earth-shattering worst and your life is over as you know it. You will never live this down! I only knew this word because my Catholic grandparents had a statue of St. Francis is a sissy in their backyard. The guy was covered in birds, for cryin’ out loud. HILARIOUS. Today, as a self-respecting, dignified pseudo-adult, I know it’s pronounced “Ah-see-zee” and basically everything else there is to know about St. Francis, including the fact that he has a super interesting haircut. Assisi is a tiny, well preserved medieval town that has been around a long, loooong time. Like, BC time. With history influenced by Romans, Etruscans, and something called the Ostrogoths. (Is this real? Did J. R. R. Tolkien write this Wikipedia page?) It’s smothered in olive trees and chock-full of churches. By my estimate… I’d say one church for every three residents, no? …YOU LIKE SMALL MEDIEVAL TOWNS. Assisi is one of the most well preserved medieval cities in Italy which you’ll understand as you walk the streets and alleys with your fancy hair braids and your dragons. I’ll let these photos straight out of Kings Landing speak for themselves. Here stands the fortress of Rocca Maggiore, a 12th century fortress I unfortunately didn’t get to explore on my day trip to Assisi. It was built in 1174 for military defense and offers one of the best panoramic views of Umbria… or so I’ve heard. This is the Temple of Minerva, an ancient Roman building built in the 1st century BC and attributed to the goddess Minerva. Minerva was the Roman goddess of wisdom and, as you can imagine, has a most horrific origin story. Please, allow me to disgust you! The Roman god Jupiter impregnated the titaness Metis then remembered hearing a prophecy that his own child would one day overthrow him. So naturally he did only what could be done: he swallowed Metis whole. (How big is Jupiter?!) Inside Jupiter, Metis forged weapons and armor for her child-to-be. Obviously, from all the pounding and weapon-making, this gave Jupiter a headache. To relieve the pain, the Roman god Vulcan split open Jupiter’s head and out popped his child… Minerva… as a full-grown woman with some kickass weapons. Oops, spoilers for Game of Thrones season 7. The Temple of Minerva now houses the church of Santa Maria Sopra Minerva. It’s small but super fancy. …YOU ARE A RELIGIOUS PILGRIM. Saint Francis was born here in 1182 and spent the early part of his life pretty well-off. His family was rich. He fought in wars. He wore clothes and ate food. He partied hard. Then he imagined things. He decided to change his ways and live in poverty and encourage others to do the same. SOMEHOW, unexplainably, this worked. The first of many miracles. He founded his own order in 1208 and got the Pope’s approval in 1210. He gained many followers on this path to poverty where everyone shaved their head in a very weird way. Seriously, what’s happening here? The Franciscan mothership: Basilica of St. Francis of Assisi. Assisi has been a major Catholic pilgrimage destination for centuries with worshippers coming from all over the world just to be the man who walked a thousand miles to fall down at your door. Despite this, the town is not overrun with visitors as you’d think and remains a quiet, chill Umbrian town. Da lat da (Da lat da)! This statue represents Francis returning from Rome after he has decided to give up his dream of fighting in war for going broke and convincing others it’s cool. Finally, he gets how depressing this is. Maybe he’s just upset that Jupiter, the god of the sky and thunder, king of all gods, was brought down by A MIGRAINE. Beneath the lower basilica lies the crypt where you will find the tomb of St. Francis in, again, a very unique site. Not underground, not in a box, but carved out of a stone slab in the center of the room. The tomb was discovered in 1818 with St. Francis’s skeleton fully intact. This building looks like a face and I hate it so much! The town of Assisi is also known for another famous resident: St. Clare. You could say Francis and Clare were best friends (with absolutely no benefits whatsoever). She was one of Francis’s first followers and began her own monastic order for woman following his traditions and beliefs. Like peanut butter and jelly those two were. Like wine and small, tasteless wafers! Is that better? St. Clare is the patron saint of television thanks to Pope Pius XII back in 1958. I guess now you know who to thank for all those Golden Girls reruns. The Basilica di Santa Chiara (Basilica of St. Clare) was built in the 13th century and today houses her complete remains, some of the tunics worn by her and Francis, and her hair, cut off by Francis as a symbol of her new faith. This is the Papal Basilica of Saint Mary of the Angels. It’s your typical grand cathedral inside… buuut with a twist. In the story of St. Francis, towards the beginning of his “poor” life, he saw a vision of Christ himself telling him to go fix his church that was falling apart. Francis knew juuuust what church he was talking about. He sold his horse and his clothes and worked hard to rebuild the decrepit church. He later founded the Franciscan order in that church and it’s currently the most sacred of all places for his followers. That church… is INSIDE this church. This church is huge. Francis’s church is tiny. I talk more about the enigma of St. Francis in this post where I also push his biography and some other books on troubled Italian outcasts that are way better than me creatively. My childhood was too normal! If only more bullies had called me “a sissy” I’d be in better shape. A day trip to Assisi is a much-needed break from the insanity of Rome and the labyrinth of Florence. You don’t need to be a religious pilgrim to appreciate the beauty and history here. You don’t have to like anybody named Francis as a matter of fact. Your idea of religion can be shouting “Jesus! Christ!” at the groundhog in your yard twenty times a day. It’s fine. You can also appreciate the Umbrian wine… the fried cheese… or the world famous Umbrian truffles. For starters. INTERESTED IN A DAY TRIP TO ASSISI? Full Day Tour of Assisi | This 6-hour full day tour of Assisi covers all the main attractions, allows for free time and lunch, and even goes to some sanctuaries and Franciscan sites outside the city walls via private driver. Find some truffles for me out there, will ya? Umbrian Discovery | This 8-day tour starts in Venice and ends in Rome, exploring tons of the Umbrian region along the way. Obviously, it includes a day trip to Assisi (plus a lil extra). Hotel Sole | This place is smack in the city center and boasts amazing views. Their restaurant/bar area is the most adorable and Italian thing I’ve seen in a long time. Read reviews on Tripadvisor | Book your room now! Hotel Berti | This place looks about as cozy and comfortable as your own home plus includes breakfast, which your own home may or may not do. Read reviews on Tripadvisor | Book your room now! Hotel Trattoria Pallotta | This place is so adorable I can’t stand it! It’s also, no surprise here, one of the top selling properties in Assisi. Read reviews on Tripadvisor | Book your room now! Take a day trip to Assisi? Read hotel reviews on Tripadvisor or book your room now! Oh, you want to learn more about St. Francis? Read this book. WHAT IS YOUR FAVORITE EUROPEAN CHURCH? 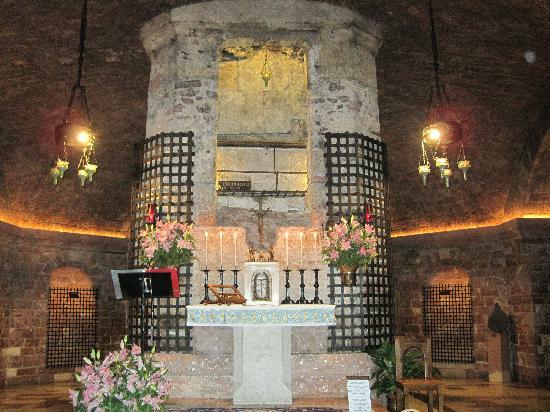 beautiful pics… you missed the whole section of St. Clare…a close friend of Francis with her own Churches..did you get to see San Damiano..the other Church Francis repaired before he understood the message to repair the church was not about the stones. It was fun for me to read a non-religious perspective on the place and I have met many non-christians who love Assisi. HI Bonnie! You are absolutely right; I left out St. Clare. So… I went back and updated the post to include some photos and more information on her–check them out! I didn’t get to see San Damiano but I definitely plan to return so now I know what I need to catch up on. I’m so glad you loved the post and you’re right–I don’t think I’ve met anyone who has been and didn’t fall in love with Assisi. Saw the update and loved it “Like wine and plane wafers was hysterical! Thanks for adding her. She sometimes gets overlooked because of Francis and he would not like that, I am sure! Mosque of Cristo de la Luz, in Toledo. It was used by Muslims and Christians, it’s tiny, suuuuper old and suuuuper interesting. Cool! Imma look it up! Thanks so much! Have you been to Assisi?